If you have a camera which need to move along the curve with constant steps you need to modify the curve to make sure each step has the same size. It's by the way common to move cameras along cubic splines. And yes, you could move the camera with constant speed (with something like Transform.Translate(Vector3.forward * speed * Time.deltatime)) and rotate it towards waypoints along the curve, but maybe that's not always possible. The solution to the problem is that we have to reparametrize the curve to make each step the same size. 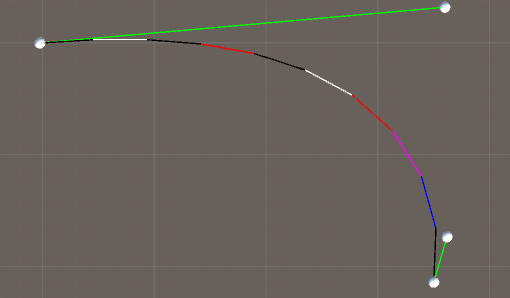 To sum it up, the basic idea is that we have to first learn how to compute the length of the Bezier curve, and then how to compute where we are on a curve at certain positions. We already know how to compute where we are on a curve based on the parameter t. But now we imagine that we move along a straight line at constant steps, and at each step we have to translate the straight line to a position on the curve by calculating the curve's t value (to get a position on the curve) as if we had traveled along a curve. To be able to compute the length of a curve we will use two methods. Both of these methods involve a root (which is not good from a performance perspective), so I'm not sure which one is the fastest, but one of them is most likely more accurate than the other. 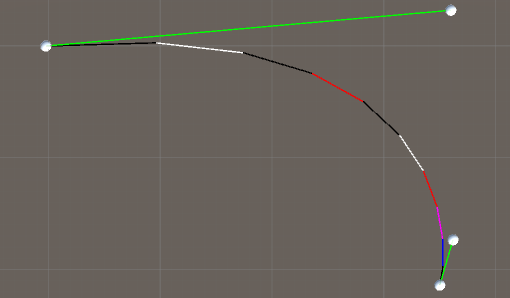 Here we loop through the Bezier curve in the same way as when we created it. But instead of approximating each section with a straight line, we will approximate each section with a second degree polynomial. The easiest way to do that is to use Simpson's rule. ...so the difference between the methods is not big. //Have we reached the desired accuracy? //What's the length of one section? If you can't tell the difference then you've wasted a lot of time, but maybe learned something new! Otherwise you've just learned how to take constant steps along a Bezier curve!